use a sharp scissor to cut the bottles into leaves... make an oblong and trim the edges to form them into serrated leaves (or zigzag). paint the petals for the poinsettias - red and for the leaves - green. 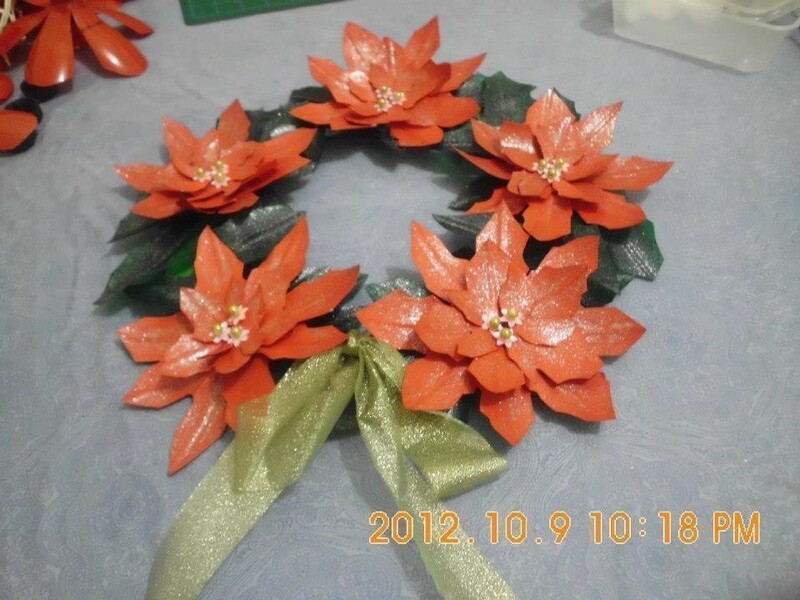 assemble now the painted petals and leaves by layering them to form poinsettias using your hot glue gun. finally, put a ribbon to add more elegance on the wreath itself...and you're done! This is such a clever idea and I love the recycle. I can see this done as water lilies. Thanks! thanks Glenda A. for your nice words... and thanks to you girls for having my creation as one of your favorites happy crafting!